Oak Knoll's culture of commmunity service and is based on its identity as a Roman Catholic, Holy Child School. Responding to the Christian call to justice, Oak Knoll challenges all students to recognize and respond to the needs of others. Community service hours are not required at Oak Knoll, but every student participates in community service. The annual school-wide service day each October demonstrates the school’s commitment to service. Upper School students, teachers, and administrators leave campus to participate in service activities at more than 15 different sites. Some Upper School students stay on campus to facilitate service and outreach activities in the Lower School. Upper School students plan educational presentations for each grade level and work with Lower School teachers on projects and activities that enable the Lower School students to provide donations for area agencies. 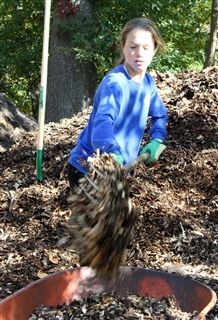 Many ongoing service projects continue throughout the year after the school-wide service day. As a joint project, students in both Lower and Upper Schools support Bridges Outreach, an organization in Summit that serves homeless people in Manhattan, Newark, and Irvington. Several times a year, Upper School students participate on bridges “runs” providing bag lunches and other necessities to the homeless. Lower School children provide bag lunches to be shared at each run. Wednesday and Friday night runs involve partnering with students from several other area independent schools to travel to Manhattan to interact with and serve the homeless. Saturday runs take place at the YMCA emergency shelter in Newark, where Upper School students provide arts and crafts and games for the children. Lunches are distributed to the children and their families. "Give me, O Lord, a love full of action." Homeless Solutions: Sixth graders and their teachers prepare and serve dinner once a month at a shelter in Morris County. All students contribute by donating non-perishable foods and fundraising for other supplies. Power of the Pen and Crayon: Students write notes and create drawings to send to retired Sisters of the Holy Child, service men and women, and senior citizens. Hunger Awareness Committee, where students raise awareness within the community while providing emergency food relief to local agencies. Campus ministry also coordinates a Service Day each year in the Upper School on which all students and teachers leave campus and spend the day in service to others. Students visit different sites from soup kitchens to a hospice, from Meals on Wheels to the Elizabeth Coalition for the Homeless. After returning to campus, students spend time reflecting on their experiences. To read about how the Lower School participates in Service, please click here. The mission trip to the Dominican Republic takes place over Oak Knoll's March break. 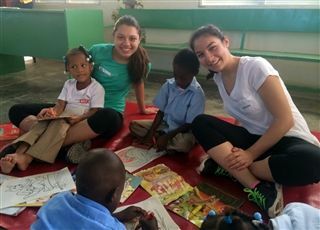 It includes working at the Holy Child mission, Escuela Fe y Alegria, Batey Lecheria near Santo Domingo as well as volunteering at an nearby orphanage. Service in New York City includes several days volunteering with such agencies as the Catholic Worker House in New York City. During the summer, students have the opportunity to travel to the Appalachian Mountains in Eastern Kentucky to volunteer at the Father Beiting Appalachian Mission Center. This summer program, established in 2010, is sponsored by the Holy Child Network of Schools and takes place at the Cornelia Connelly Center on the east side of New York City. Oak Knoll, along with all the other Holy Child high schools, sends two students and one chaperone to participate. The student volunteers, who are rising juniors and seniors, meet and plan the activities which serve as an orientation program for incoming students at the Connelly Middle School. The five-day camp includes: prayer, academic work in the morning, reading, writing, and book discussion, introduction to Cornelia Connelly through reading, "A Generous Love, Life of Cornelia Connelly," art, athletics, group building activities, day trip and swimming at Holy Child Academy, Old Westbury New York, barbecue for the campers and their families. In June, a group of Upper School students, recent graduates, and teachers volunteer to run the Sacred Heart Summer Fun Program for one week at the Sacred Heart School in Jersey City. Oak Knoll students plan, organize, and run all of the activities during the camp including enrichment activities, dance lessons, arts and crafts, and outdoor games. This opportunity not only provides Oak Knoll students with another avenue to give back to the community, but is also a wonderful leadership opportunity.